According to The Star Tech News, penetration of smartphone in Malaysia hit 63% in September 2013, I believe now should be close to 70%, therefore when choosing a postpaid package, call and internet data bundle all in one plan will be my first choice. SMS would not weight as heavy as before, since almost every smartphone users got Whatsapp, Line, WeChat, KakaoTalk, and so on. There are more than 10 telcos in Malaysia that offering various packages, but I’m choosing only the Top 4 largest telcos (Celcom, DiGi, Maxis and U Mobile) and we focus on postpaid packages. The first comparison chart will be all the introductory plan (aka cheapest plan) from each telcos. Based on the introductory plan comparison chart, which telco package you will exclude it first? I’ll exclude MaxisONE plan lite at first, not because it’s the most expensive among others, but also no free calls nor sms to other networks. End up the monthly bill can be very high if you’re making a lots of call to other networks. Second plan I drop is U Mobile. Although DiGi is RM 17 more than U Mobile, but when you make 100 minute call to U Mobile from U28, charges is as DiGi, but data is 1GB lesser. 60 minutes call and sms is actually not much, but RM 23 is very much, therefore Celcom is not my favorite too. I will consider only DiGi based on the comparison chart above. Now let’s see the comparison chart that focus on commitment range between RM 50 and RM 100, although commitment of DG SmartPlan 108 is RM 103, but I still include it in this comparison chart. Celcom First One Plan 5GB is the first plan I would not consider, because I’m not using that much data. What about you? Under the same condition, 5GB data is too much for me, therefore DG SmartPlan 108 also not my cup of tea. This time I choose not go to Celcom because 60 minutes is really tiny when compare to DG SmartPlan 78. For RM 5 extra can get 140 minutes, why I still want to consider Celcom? 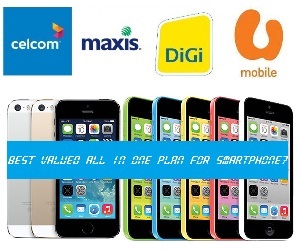 Now we left only 3 plans from DiGi and U Mobile, which one is your favorite? Among these 3 plans, for casual usage, U Mobile Unlimited 50 would be my favorite best valued all in one plan, what about you? Based on the comparison chart above, when we compare Celcom to U Mobile, Celcom is offered 5GB of data, but call minute is very less, logically people would choose U Mobile than Celcom, unless you use lots of data but less call. So I would drop out Celcom at the beginning. Among DiGi, Maxis and U Mobile, unless majority of your friends are using U Mobile, otherwise U Mobile will be the next option we would not consider. Now leftover DiGi and Maxis, based on news article published on The Star, estimated average data usage in 2018 is 2GB, meanwhile most of the users are not using as much as 2GB at this moment, so Maxis plan will be my choice with truly unlimited call and sms to all networks + 2GB mobile data. Among the plans we mention above, if you’re heavy user in making call and sms, then you should really consider MaxisOne Plan. Every plans has it’s own benefit, but to me, Celcom I would not consider, as it’s not worth when compare to others. So, which plan is your favorite all in one plan? Want to share with us? *update: DiGi RM 5 rebate is applicable for first 12 months only. ** If you’re looking for huge Data quota plan instead of calling + sms, check our new post ‘Best Postpaid Data for Smartphone’ here. well for me need more data la since now by 3rd week all gone already..now using 3GB lo…which one is value for money in term of more data? If 3GB is not sufficient, perhaps you should check out DiGi SmartPlan 108 (RM 103/month), compare to Celcom First One Plan 5GB (RM 88/month), although RM 15, but extra 240 minutes call and 240 SMS which seems better deal. in term of price, celcom 1 plan will b cheaper, RM68 only for same 3gb every month. it’s depends the user mah… bt nowaday gt lots heavy data user like my frens always watch drama online LOL so this plan quiet suit to them..
Not really, it depends on the area. Many years ago it used to be the best coverage even in jungle can receive, but now since sharing network, all 4 major telcos coverage are almost similar. So I would suggest test the network in the area you frequent use before you decide to stick the telco, especially contract for 24 months. Although many people are not using much call, especially young generation, but elder person and especially those businessman or sales agent are much rely on call rather than via viber (line, wechat, skype etc) call which much depend on the stability of the signal. Another situation can be applied on couples, for example girl is supplementary line of her parents, then huge call allowance plan is essential for the guy in order to communicate with she. oh really?? thanks for the info..so how many calls u made in a mth? I’m not using Maxis, but I’m using DiGi Postpaid Simple + 250MB data for RM 78 monthly. I make call more than data, because my home and workplace have high speed internet, so my data only used for traveling in between these 2 places. DiGi postpaid simple lets you use RM 100 worth call+sms, but pay only RM 50. It’s equal to about 666 minutes or 1,000 sms. My parents are on umobile while I’m on Celcom. uMobile rates are very decent but if only they would offer more data tho. plan to chg into higher data plan, 3gb minimum.. 1 mth hasnt fin my 1gb ady run out.. =A= which coverage for data is better??? Now all 4 major telcos have similar coverage. To test the best telco that cover your area, I would suggest you to grab a prepaid from them to test the coverage for couple of days. I used to do so before I really stick telco, especially for long term contract, such as 24 months. Otherwise it will be really hurt. Then only go for choosing the best suit plan. oic…bt their other benefits is totally nt same at all make me confused @@” i m the one who more rely on data, while phone and sms is nt so important for me, gt plan with more data and cheaper? If more data, Celcom is cheapest at this moment, and 60 minutes call and sms should be sufficient if you did not use it much. used digi before, bt the coverage is weak.. so thinking shld chg to celcom 1 plan or umobile unlimited 80.. I am thinking of changing from Maxis to Digi. Currently, I signed up for 250MB data. I don’t chat or sms much. I thought of switching to Digi Smart Plan 50. Will this be good and how about Digi coverage overall? Can you elaborate more on your usage? Such as call, sms, data usage as well as current Maxis plan and your monthly usage (bill payment). Please let me know good network\Plan for making ISD call in terms of c . I’m new to malaysia. How to transfer xpax credit to tunetalk prepaid simcard? It’s impossible. Xpax is under Celcom, Tunetalk is under AirAsia Tune. Both are different company. stable call line which cooperate with Celcom. prepaid card active period last 28months once you top up RM50 within the 1st month after activate the simcard with new registered number. can use back your old phone number for auto entitle 28months active period. call rate as low as 5sen to all telco. sms rate as low as 2sen to all telco for 10 frens n family. Rebate 6% Gst to your credit account. RM29.99 for 1.5G/ 30days, Xox Data internet speed better than Celcom 3G. Share more to save more! *Admin – Self promotion is prohibited!